MODERN-DAY VAGABONDS ON THE ROAD OF ADVENTURE! 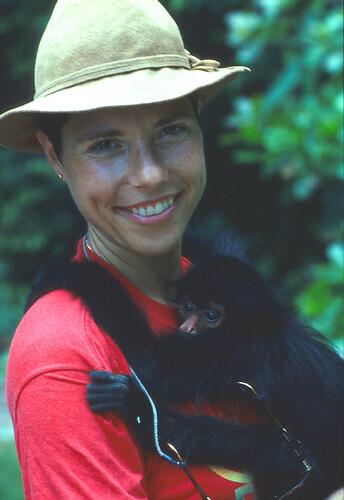 Known for her ability to make friends anywhere, Monika became buddies with this young monkey in the Amazon Jungle. Even with her five languages, she could not explain to her new friend why he couldn’t come with us. If you had stopped Gary Wescott on his way to journalism class at San Diego State University in 1967 and told him he would spend his life traveling around the World; or if you could have caught Monika Mühlebach Wescott as she peddled her bicycle home from school in the small Swiss village of Wiesendangen and tried to explain that she would join Gary in Mexico ten years later—–well, you might have en­coun­tered some disbelief. Never-the-less, for the past thirty-nine years, these two intrepid ad­ven­turers and photojournalists have globetrotted from the arid deserts of Afghanistan, to the deepest jungles of the Amazon, and across the frozen steppes of Siberia, with sometimes no more than a camera and a backpack. Their travel/adventure stories have been published in fifteen countries and ten languages around the World, including Off-Road, Four Wheeler, Power Stroke Registry, Front Line, My Ford, Trailer Life, Truck Trend, Motorhome, Camping Life, and other U.S. magazines. 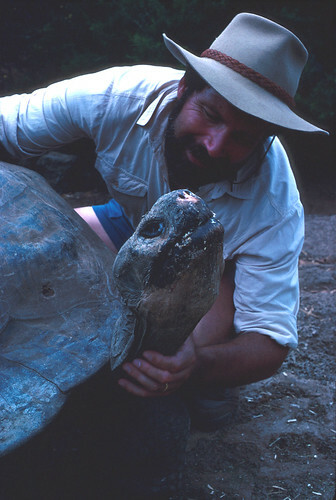 During a 1988 visit to the Galapagos Islands, Gary came face to face with the original mascot of the Turtle Expedition, travelling slowly with its house on its back. A list of product sponsors on The Turtle Expedition’s trucks reads like a who’s-who of the automotive, marine, and outdoor equip­ment world—Michelin, Goodyear, Lowrance Automotive, Amsoil, Warn, Red Line, K&N, Racor, PIAA, Rancho, Everpure, Keiper Recaro, Blue Sea, Coleman, Dometic, Norcold, Xantrex, Eureka!, North Face, Cascade Designs, MSR, Old Town, Sage, Yakima,—–to name but a few. In 1989, The Turtle Expedition spent fourteen months explo­ring South America. After shipping their vehicle to Colombia, Gary & Monika drove more than 50,000 miles, circumnavigating the continent and crossing it twice. Their path took them from the snow-bound Andean Mountains, over passes as high as 16,710 ft.; across the vast Atacama Desert, where in places, a drop of rain had not fallen in recorded history; and through the jungles of the Amazon Basin in Peru, Colombia and Brazil, where mud-choked trails were often impassable, even with four-wheel drive. Barges were needed to travel up swollen rivers. 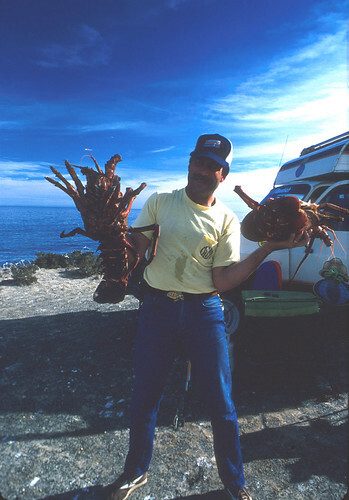 Always in search of extremes, finding these giant lobsters was a goal during Turtle Expedition’s first video filmed in 1987. The Treasures of Baja California is slated to be re-released soon. In the winter of 1996, they succeeded in driving completely across Russia, including Eastern Siberia, from the Pacific to the Atlantic Ocean. Siberia alone wraps around one third of the northern hemisphere and spans ten time zones. Complicated by the fact that there were no all-weather roads across the Far East, most experts, both Russian and American, said it couldn’t be done. In temperatures which can drop to below -100°F, plastics and rubber become brittle and even metal can crystallize and snap. Rumored shortages of food and fuel, and reports of highway robbery had to be con­tended with. Using a GPS and U.S. Defense Mapping Agency Navigational Charts, Winter Roads were followed for over 3,000 miles, including a 640-mile leg on the ice of the frozen Lena River. The expedition involved more than simply crossing two continents. The couple took time to explore many parts of the former Soviet Union, including Lake Baikal, Tuva, and Altai regions. Eleven months and 16,000 miles later, battling the 80-mph winds and 3-foot snowdrifts of an Arctic gale, The Turtle IV pulled into Hammerfest on the North Atlantic’s Norwegian Sea, the most northern town in the World you can drive to. To their knowledge, they had become the first for­eigners to ever drive completely across Russia without using trains or barges, and in all likelihood, no Russian has ever attempted this difficult route. But Hammerfest was only a stepping stone, not the end of this three-year global circum­navigation. After exploring some of Central and Southern Europe, sorting through 15,000 slides, and publishing over 70 magazine articles, the couple retraced their route through Finland and continued around the World, with stops in Norway, the Faroe Islands, Iceland, New­foundland, and Nova Scotia, on their way back to their California homebase. 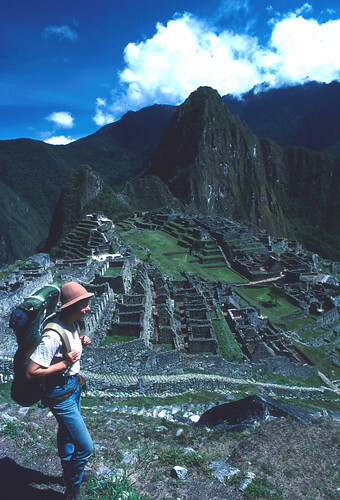 After an exhausting two-day trek from Kilometer 88, we reached the famous Macho Picchu ruins near Cusco, Peru. Growing up in Switzerland, Monika has been an avid hiker all her life. Long-range plans are currently under way to drive from Lisbon, Portugal, to Shanghai, China, following the Northern Silk Route. The Trans-Eurasian Odyssey will cross as many as twenty-seven countries and produce a documentary series for television on the children of each nation.